One of America’s favorite backyard pastimes is one that distinguishes Cashiers and Highlands from many other mountain towns. What is it? Croquet. The traditional game played with wooden mallets and balls brings laughter and competition to the area known for its lush landscape of waterfalls and golf courses. 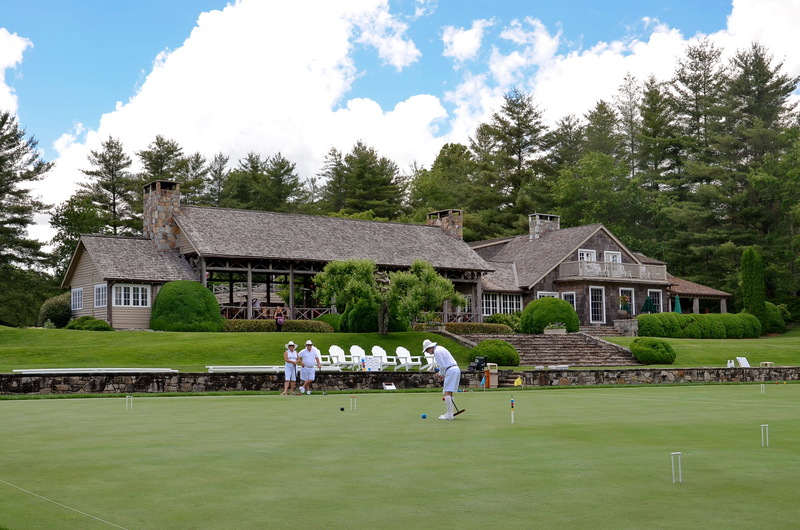 From tournaments to weekly gatherings, summer on the green takes on a whole new meaning with over 1,600 croquet players in the highlands of Western North Carolina. It is a sociable spectacle where teams face off to hit a ball through a course of hoops or wickets (as Americans have named them). Croquet dates to the 1400s, but it didn’t become a recreational activity in the United States until the 1860s. The game turned into a tradition for many East Coast families, and has remained part of the lifestyle on the Highlands-Cashiers Plateau. Despite its French name, croquet is very English. The polished appearance of the wisely dressed players and immaculate grass can be deceiving. Players must outwit their opponent(s), creating a slight dog-eat-dog aspect to the game. If you can manage to roquet, or hit a rival’s ball, you might gain a slight edge with gaining an extra shot. Strategy is the key, as you should consider not only your current shot, but the one after that and the one after that, making this game an authentic technical challenge. The classic game of croquet brings the community together for social events throughout the season. With clubs offering wine and wicket hours, it is common to see players sip their favorite vintage in between running a hoop. The Chattooga Club is an East Coast croquet treasure with its world-class courts and facilities. Offering a nostalgic feeling of the early 1900s with its scenery and services, the club is postcard perfection. It is a United States Croquet Association (USCA) member club. Cedar Creek Racquet Club is minutes from both Cashiers and Highlands with a course overlooking its lake. Down-to-earth in nature and perfect for a family-friendly escape, it’s named one of the top twenty tennis facilities in the country by World Tennis Magazine. Burlingame is nestled among the Blue Ridge Mountains and adjacent to the Horsepasture River. It is breathtakingly beautiful, and its croquet lawn is an integral part of member activities. It is a United States Croquet Association (USCA) member club. The Country Club of Sapphire Valley is known for Wednesday Twilight Croquet, Friday Croquet Mixer, and Sunday Wine and Wickets. Prefer to watch? Take in the serene vista from the Mountain Verandah and watch the competitive spirit unfold. Highlands Country Club is distinctive with its Donald Ross designed golf course and unspoiled mountain landscape. Tuesdays and Thursdays play host to Wine and Wickets at this alluring, sociable croquet lawn. Cullasaja Club is known for its par-72 championship golf course designed by Arnold Palmer, as well as Ravenel Lake, and the cascading waters of the Cullasaja Rivers; however, the private club opened a full-size croquet court, The Lawn at Cullasaja, in 2013. Highland Falls Country Club is set amongst heart-stirring long-range views of the Blue Ridge Mountains. Enjoy the social game while breathing in fresh mountain air, or visit with friends on the croquet pavilion, which offers a wood-burning fireplace, wet bar, and washrooms. Lake Toxaway Country Club is set amongst peaceful woodlands, offering a regulation-sized croquet lawn. With a 20-acre golf learning center, five Har-Tru tennis courts, and a private lake, this club is deeply rooted in scenic elegance. It is a United States Croquet Association (USCA) member club. Trillium Links & Lake Club is the perfect lake escape in the Blue Ridge Mountains. It is a private residential, lake, and golf community known for wine and wickets each Monday and Thursday afternoon during the season. Tips to enhance your croquet game: Use a regular golf ball rather than a croquet ball when practicing. Keep your head down and make good contact in the ball, and take note of your swing. This will help you recognize how fast or hard you are hitting the ball, creating a more precise rhythm for your swing.